The new Mazda CX-9 is a beauty of a SUV; having not been in open for a year or so, it was easy to see what is new and improved: like the quiet, ease of operation and just all-around pleasant sport-ute. Having discontinued the CX-7, Mazda now offers the CX-9 and CX-5. The CX-5 replaced the CX-7 and although a smaller vehicle, the CX-5 offers more overall interior volume and more cargo capacity. The new CX-5 provides better fuel economy too, equipped with Mazdaâ€™s new 2.0-liter Skyactiv 4-cylinder engine. Complete with three rows of seating (7-passenger), the CX-9 amazingly, doesnâ€™t feel as big as it looks. Power from Mazdaâ€™s 3.7-liter, V-6 engine seems adequate, and this SUV is an easy car to maneuver, with a nice wide turning radius. Seeming more athletic than most SUVâ€™s in this category (think Dodge Durango, Chevrolet Traverse, Ford Flex), the CX-9 makes one think about what Mazda can and does offer in its vehicles: the Fun-to-Drive factor. The CX-9 also offers such amenities as standard tri-zone automatic climate control, and available rear entertainment system. Cargo space is huge. The display screen, however, is a little puny and other technology not as advanced as in some vehicles today. 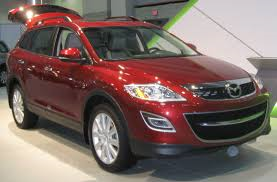 The 2015 Mazda CX-9 is offered three trim levels: Sport, Touring and Grand Touring. All-wheel-drive is also available in all models and comes standard with a towing prep package, The Grand Touring edition is the only model that can be equipped with the towing package in front-wheel-drive. Standard features, as with most vehicles in this price range are plentiful. If you elect for the Sport version, it will include 18-inch alloy wheels, a roof spoiler, cruise control, full power accessories, a trip computer, three-zone automatic climate control, a tilt-and-telescoping leather-wrapped steering wheel, cloth upholstery, a 5.8-inch touch-screen display, Bluetooth phone and audio connectivity and a six-speaker sound system with a CD player, HD radio, Pandora radio capability and USB/auxiliary inputs. If you have to have heated mirrors and seats, with the 8-way power-adjustable driver seat (and lumbar, of course), youâ€™ll have to pop for the option. Go Touring and you can add the heat/seating option package as standard, and add to the fun automatic headlights, leather, four-way adjustable front passenger seat, blind-spot monitoring system, rear parking sensors, a rear cross-traffic alert system and a rearview camera. Exclusive to the Grand Touring is an optional rear-seat entertainment package with a 9-inch screen that also includes an 11-speaker Bose surround system with satellite radio, the navigation system and a 115-volt power outlet. However, this package cannot be combined with the Technology package (translation: you’ll have to choose between the entertainment screen and the sunroof). 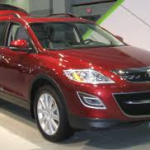 Available with either front- or all-wheel drive, the 2015 Mazda CX-9 is equipped with-as noted above-Mazdaâ€™s 3.7-liter V6 engine (273 horsepower/ 270 pound-feet of torque). The transmission is a six-speed automatic with manual shift control. For those wanting to do some towing, expect to be able to pull up to 3,500 pounds. Of course, all the latest safety equipment is included as standard: antilock disc brakes, stability control with a rollover sensor, front-seat side airbags, full-length side curtain airbags and active head restraints. Touring and Grand Touring models include the latest in technology to keep driverâ€™s safe, including a blind-spot monitor, rear parking sensors, a rear cross-traffic alert system and a rearview camera. NATSHA rating for the 2015 CX-9 is four-star (out of five possible), three stars for total front crash protection and five stars for total side-impact protection. Equipped with larger tires, the Grand Touring model loses a little feel of comfort, taking on more of a harder, sportier ride. But we didnâ€™t find this objectionable at all. It is a well-handling vehicle. EPA Fuel economy: 16/22 mpg., avg. 18 mpg.